What is meant by comparative contrast essay? Some things should be always kept in mind in order to make an effective comparative contrast essay. Rather than being too straight forward and formative, the approach with which this type of essay should be written should be more natural and should look subtle. Provide with some strong basis for this. A strong basis for comparisons and contrast will make the essay look more powerful and worthy. The essay question should be answered by the writer himself in the essay. Make it simple and concise. The main thesis should be developed by the writer himself to make it more original as the question which may simply be asked will make it compare the two arcs. 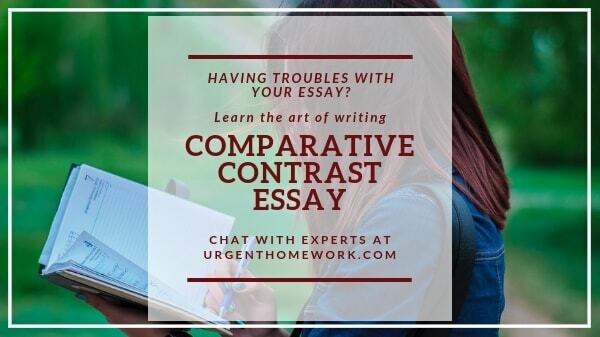 The basis of a comparative essay is necessary as it would clear the air about the theme, the device common or the concern for both subjects or work and with that further making comparisons and contrasting. A list of all the similarities and the differences should be made and studied upon. Research work is very important in this type of essay writing. If the facts are too under developed then it may look dull and uneasy. After noting down all the similarities and differences the next important step is to validate those points made. The differences should be validated as the difference and similarities as likeness. After doing this, analyzing the subjects and studying them are very important. The comparison difference and similarities list which you have drawn up is not the only outline of your comparative essay and should also provide with pointers which would help in making the initial body structure of the essay. What are the structures and methods of Comparative contrast essay? Also known as the alternative method, point by point pattern is very effective method of writing the comparative essay. It is also the most used type of method for the construction of the structure of the essay. In this method, two separate pointers are derived from the subjects. The subject are denoted as subject A and subject B. Point by point the similarities are drawn out from each subject and analyzed and validated. After that, point by point differences are drawn out and analyzed simultaneously. This following mode of method will result in the making of 5 equivalent paragraphs for the essay. In those paragraphs, the comparisons and contrasting should be done consecutively. In the conclusion part, the main objective’s answer which is concluded will come out. The main steps include the introduction of the thesis which you have written and followed up by discussion on both the subjects together for one paragraph having each point of contrast as well as comparison. In the final part of this method, the conclusion which the writer will restate will be included and shortly summarization of the essay. Note down any references which you have taken into a bibliography in the end.